Home » Schedule Genesis Assistance Dogs, Inc. to visit your meeting. Schedule Genesis Assistance Dogs, Inc. to visit your meeting. 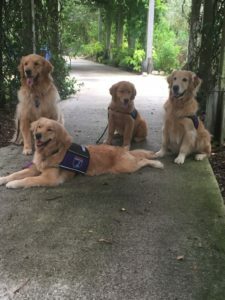 Genesis Assistance Dogs, Inc. prides itself on community involvement and the opportunity to provide educational information regarding our program and how our assistance dogs provide service to their handlers. We are always happy to arrange a time to visit with your organization and get to know our neighbors while providing the opportunity for your group to meet our amazing assistance dogs. Our team visits are very popular, so we ask that you plan for us to visit at least 6 weeks in advance. Please contact Julie Collins, Board Member via email at: julie@genesisassistancedogsinc.org, or by phone at 407-463-7545 to arrange a visit to your organization as soon as possible. Thank you in advance for your interest in Genesis Assistance Dogs, Inc.!